We have implemented a really useful delivery checker tool which allows you to see all the available delivery options for a product getting delivered to your postcode. Any associated costs with the delivery options will also be displayed here. 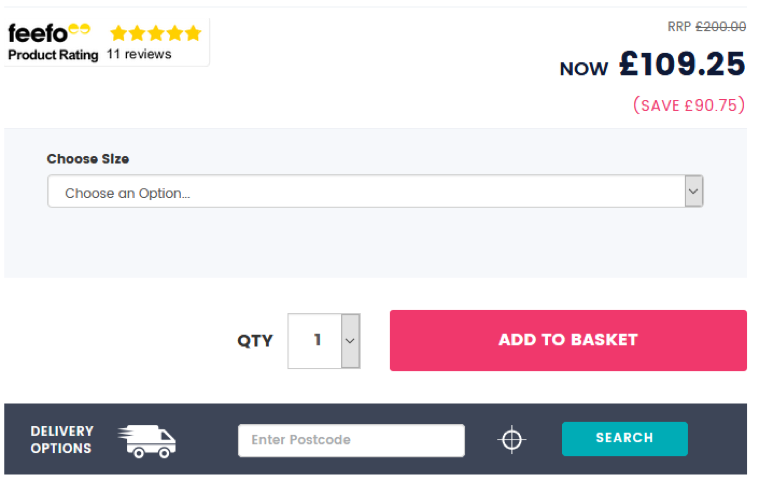 Simply input your postcode into the delivery checker and click the ‘search’ button. Please be advised the delivery checker will not allow you choose the delivery date, this will be possible during the checkout process. We offer deliveries between Monday and Friday on all products, we also offer weekend deliveries on some products for an extra charge. All the available delivery options would be presented under the delivery checker on each product page. If you have not chosen a specific day for delivery at checkout, the courier company we choose to send your item with would contact you to book in a delivery date and time. For the majority of the UK we will always offer a Free Delivery option however there are a few locations for which we have not been able to provide this due to the charges incurred from our courier companies. Please see below list of chargeable postcodes. Depending on the item you wish to purchase and your location we may be able to offer an Express Shipping service. This is a next working day service – if the order is placed before 11 am, that same day would be classed as the first working day, meaning the item will be delivered on the next working day. If an order is placed after 11 am, the next day would in fact be classed as the first working day and the order will be delivered on the working day after the next. For example, an order is placed after 11 am on Monday; the first working day would be Tuesday meaning the item would be delivered on the next working day which would be Wednesday. Weekends and Bank/public holidays are not classed as working days. The standard delivery times for the next day service is between 8 am and 6 pm, we do however also provide a ‘Before 1 pm’ service which will be offered to you upon selecting your delivery. Depending on your location we can offer a weekend delivery for an extra charge. If this option is available for your location it will be offered during the checkout process. We provide a 2-man service for all our products, which means the driver will take the items to the room of your choice. This is a great option for anyone who needs the item to be taken upstairs to their bedroom. If you require this service please select this during the checkout, any associated charges will be shown. Depending on the item and your delivery postcode we may be able to offer additional services such as assembly (available for divan beds only) and disposal of your old items. These options (if available) will be offered to you at checkout. If you have chosen a delivery date at checkout, the order will be delivered on this date. If you have not chosen a date, the courier company will call or text you to advise of the delivery date. Delivery to the ground floor. Next working day service. Delivery to the ground floor. Saturday Delivery. Delivery to the ground floor. Delivery date of your choice. Delivery to the room of your choice. Choose delivery on Saturday or Sunday. Delivery to the room of your choice. Please note delivery services vary depending on location. Please use the delivery checker on the product page to check the services available for your area. Unfortunately we will have to charge you an extra fee for the following postcodes due to their geographical location. This fee is paid at checkout. We have done our best to get around this but we cannot find a service that will deliver at normal rates. Please see below tables for areas which incur an additional delivery charge. The standard one-man delivery service is only guaranteed to the first accessible door on the ground floor. Delivery vehicles can be as large as 7.5 tonnes, if your property does not allow access to vehicles of this size please let us know upon placing your order. We will be able to arrange for a smaller vehicle to come and deliver. In rare circumstances beyond our control the delivery may take slightly longer than the time frames above. In this case, we will inform you immediately and arrange with you the quickest delivery possible. The two-man service will only deliver up to the third floor if there isn’t a lift available. If a lift is available they will deliver to any floor. For more information on deliveries, check our Terms and Conditions (Sections 4 – 8). Please contact us for more information if you are unsure.